Gateway to Ko Rok - Ko Lanta (Island), Krabi, Thailand. 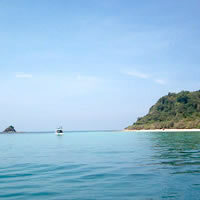 The twin limestone islands 30 kms south of Ko Lanta Yai are named Ko Rok Nok and Ko Rok Nai with only 100 metres between them. 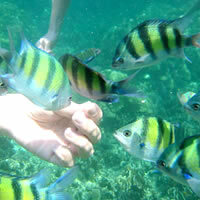 They are counted as part of Ko Lanta archipelago and are under the same district. There are almost no people living on Ko Rok, only the Marine Park Rangers reside here, leaving the islands to remain unspoiled. Ko Rok Nok has some beautiful beaches to offer, Ao Man Sai Beach in particular is ranked in the top ten most beautiful beaches in Thailand. 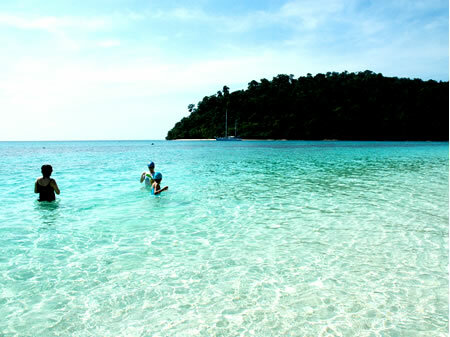 This long beach has real white powder sands and crystal clear waters, with a fairly shallow tide rich with fabulous corals offshore. The beach is verdant with rainforest and mangrove tree, and just a few steps walk into the forest enables you to see a jungle of huge banyan trees, about 6 metres wide, which gives the beach its name. 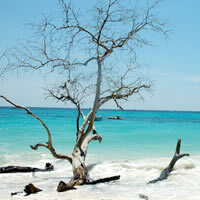 A little further into trees brings you to another beach named Ao Tha Lu. The sands here are shaped like a horseshoe and surrounded by black limestone cliffs. 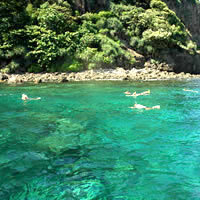 Ko Rok Nai is just 100 metres away and can be easily swum across to. 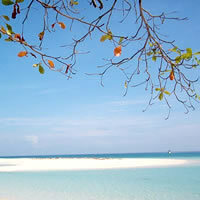 One particularly beautiful beach here is named Ao Sarn Chao (Spirit House Beach). The fishermen built spirit houses here to protect their warships and eventually the beach was named after the tradition. At the southern-most end of this island there is some stunning geography and a pole mark which points to the end of Thai land. 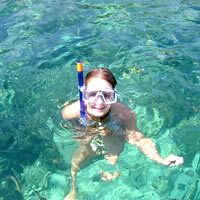 Between these two islands is a snorkellers’ paradise with its’ glass-clear waters and visibility of up to 20 metres. 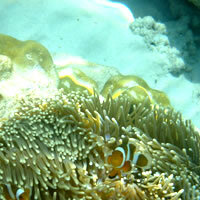 The long reef extends for a square mile with both soft and hard corals. and hard corals. 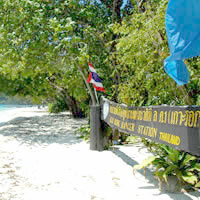 There are no resorts on this paradise island, just the Ko Rok Ranger Station and Office under the Ko Lanta National Marine Park local department here. They can provide tents and camping ground for rent at a cost of around 300-700 baht depending on size. There is a communal restroom and toilets which are clean enough and basic drinks can be bought at the office, but you need to make your own provisions for food. A charcoal brazier can be borrowed for cooking, and we recommend you take some instant food-stuffs and/or bread/rice to use as staple stocks, when you leave Ko Lanta as fishing is not allowed on the island under National Marine Park protection rules. On Ko Lanta, many agents offer a one-day trip to Ko Rok, but none offer an overnight trip, this must be personally arranged by you. You can negotiate with an agent on Lanta to drop you off and pick you up on pre-arranged days. The popular appeal of this island is so great, that many groups expecting to stay just one night on Ko Rok end up spending a week there. The easiest access to Ko Rok is from Ko Lanta Yai as it has the nearest pier. There are many tour agents offering a one-day trip by speed boat, price for which is around 1,400 baht inclusive of a lunch box or buffet on the beach. The trip takes about an hour. There is an agent in Trang Province also offering this trip, but the journey takes more time as the ferry boat is slower. Some tourists rent a small private long tail boat to visit the island. No tour agents offer the service but it’s possible to negotiate for a trip, the price for which should be around 5,000 baht (130 USD) and take two and half hours. When made by long tail boat, the journey is not for everyone, as it’s common to experience stiff waves. It can become a little frightening in stronger seas with small boat, yet it’s worth remembering that long tail boat accidents here are extremely rare. If you want a more exclusive and quicker service, it’s possible to rent a private speed boat. A one-day rental costs around 18,000 baht (420 USD) starting the day at 08:00 and finishing around 18:00.